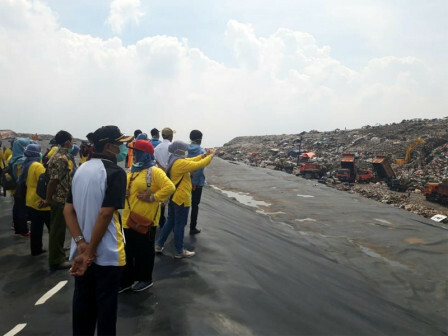 50 residents who represent four RWs in Central Jakarta visited Bantar Gebang Integrated Waste Management Facility (TPST) for educational purpose.
" We take them to see the real condition in Bantar Gebang TPST"
Those four RWs: RW 01 Cikini, RW 03 Cempaka Putih Timur, RW 06 Kebon Kosong, and RW 02 Rawasari Urban Village; are appointed to be the pilot project of regional strategic activities (KSD) to reduce waste from its sources. Through this activity, Jakarta Environment (LH) Department's Community Participation Section Head, Djoko Riyanto wants to encourage and motivate residents to reduce waste from the source early. "We take them to see the real condition in Bantar Gebang TPST. We also educate them about the importance of sorting and reducing waste from early age. Because as we can see, Bantar Gebang TPST has limited capacity," he explained, Thursday (4/11). The representatives also got explanation from LH Department's Integrated Waste Management Unit Team (UPST) about waste management in Bantar Gebang TPST and went to see disposal zone from geomembrane, composting area, and urban farming area. "We expect them to socialize and educate their neighbors to be more concerned towards waste management. Thus more people can work together to reduce the waste," he stated.